First of all, I apologize for the phone pictures. This was not a recipe I planned to post, but one that I photographed obsessively because, you know, that’s what I do. Anyway, this pizza turned out to be SO delicious that I thought it would be criminal not to share it with you. So here it is. I started craving a breakfast pizza on Saturday, after my friends Dana and Juliet brought it up (in all its delicious detail) on twitter. So often when those two start talking food I drop everything and eat what they’re eating. Because they eat delicious things. 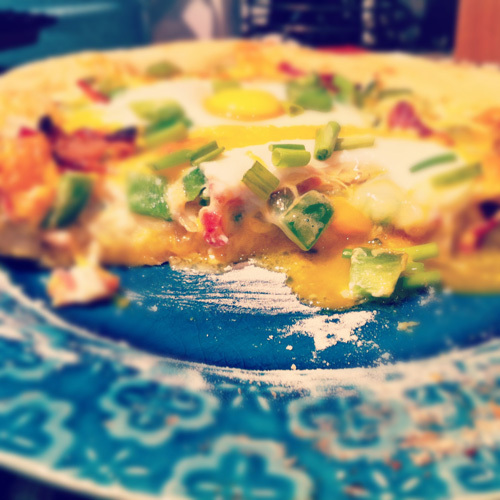 A breakfast pizza is a pizza topped with anything you love about breakfast. I’ve seen ones with a million combinations of breakfast meats, cheeses, vegetables, and, of course, eggs. This one included smoked bacon, caramelized onions, green peppers (the last from our garden), jalapeños, three cheeses, green onions, garlic, and eggs. And oh. my. delicious. I want to marry this pizza. 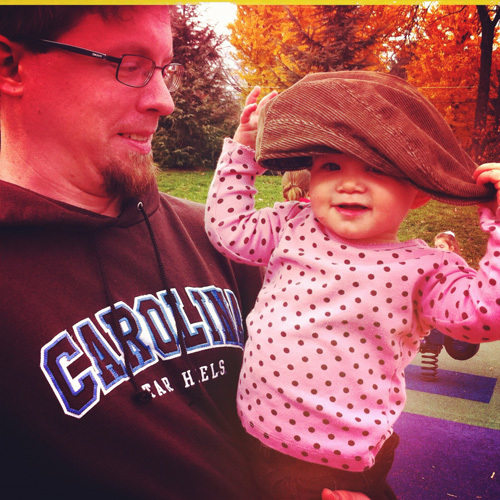 Yesterday we also headed to VA to hang with the nieces and Megan. 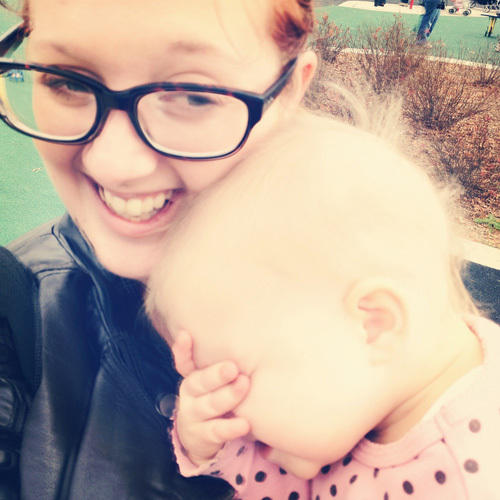 Can I just reiterate how great nieces are? 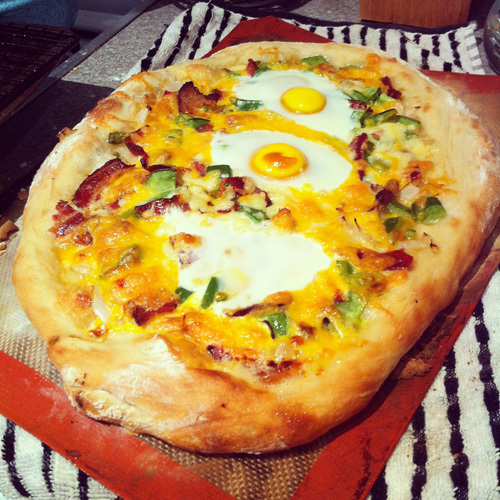 Nieces + breakfast pizza = wonderful Sunday. 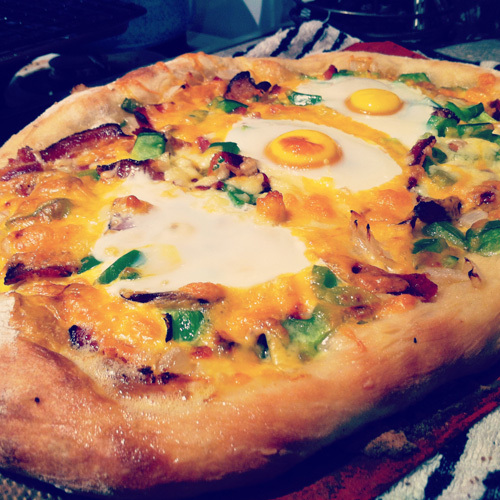 Related to, you know, the major holiday coming up later this week, I think this breakfast pizza would be the perfect morning-after meal for the family. Big enough to serve 4 or 5 adults, loaded with delicious (and, if you’d like, leftovers), it’s easy and very, very good. While your dough is rising, cook your bacon. I like to cook mine on a rack in a 375 oven (takes about 30 minutes). It cooks nicely and evenly. When I do that, however, I always cook one or two pieces in the pan so that I have drippings to caramelize the onions in. So, get your bacon going. Dice your onions and pepper, and mince your garlic and jalapeños. In your bacon drippings cook the onions, garlic, and jalapeños until nice and brown. Next shred your cheese. Roll out your dough and heat your oven to 500 (or as high as it goes). Start with a layer of your soft cheese. Then spoon your onions over this. 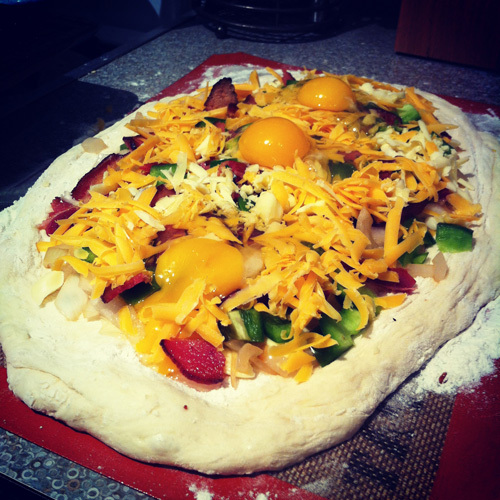 Add peppers, bacon, and cheddar cheeses. Crack three eggs over the whole pizza. Sprinkle the pizza with coarse salt. Brush the edges with olive oil and salt. Bake for 12 minutes for drippy eggs (my preference) and 14 for solid egg yolks. Enjoy! 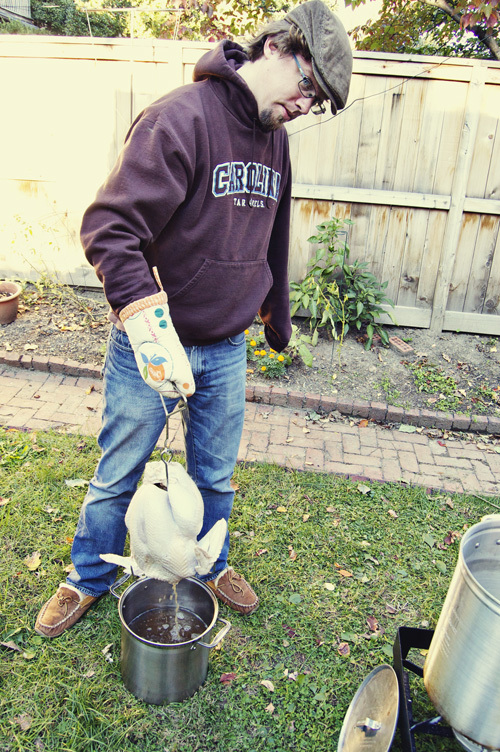 For those of you who have followed the blog for a while, you may remember that last year Dan and I fried our first turkey together. It was an awesome learning experience and that turkey was delicious, but it was kind of terrifying and afterwards I got a lecture from the Captain about wearing protective wear (says the guy who fries turkeys in his garage). 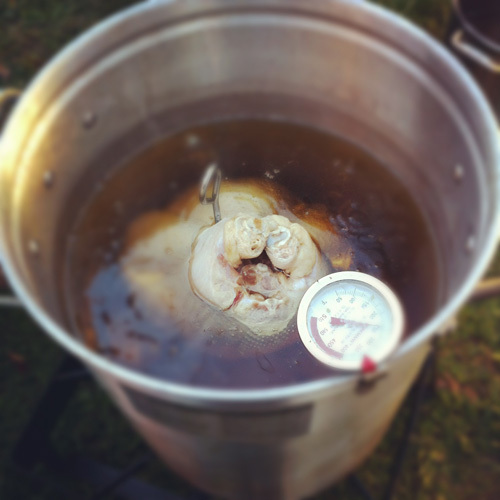 So, this year, we went into the whole turkey frying thing a little more cautiously. Meaning, Dan read the transcript from the Alton Brown turkey frying episode. Y’all, that is exactly why I love my husband. Because he reads tv show transcripts to learn. For funsies. Alton Brown has never lead us astray, and this turkey was no different. His recommendation, to prevent the thing where the oil gets all furious when you put the turkey in, is to lower the temperature to around 230, add the turkey, add more oil if necessary, and then raise the temperature. It worked like a gem. This turkey was incredible. I apologize in advance for the gratuitous photographs. I promise you, this is about 1/3 of the amount that I took. See? No crazy bubbling over! Just a calm, happily cooking turkey. The most delicious turkey I have ever had. The bourbon-maple glaze. And, below, our friend Chris holding up the back of my “studio” so it wouldn’t blow over in the wind. Also, I think he was trying to figure out a way to steal the turkey without anyone noticing. 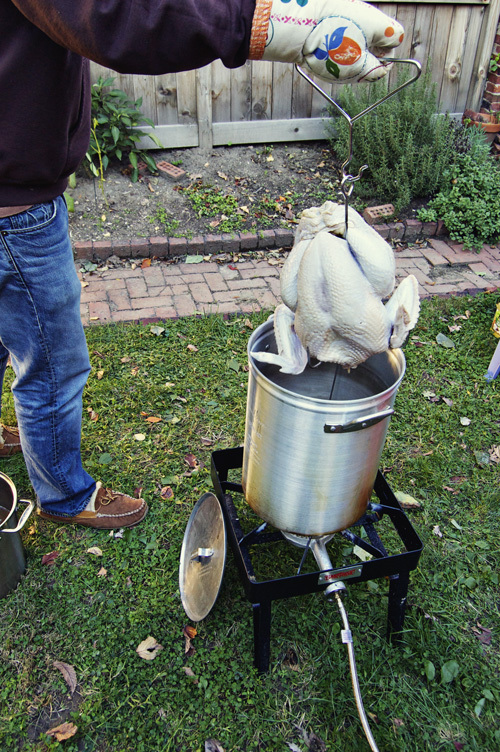 To fry a turkey, you need a large burner, a pot meant for turkey frying (you can get them cheap at any home improvement store), oil to fill your pot, and an oil thermometer. If you’re not frying, this glaze would still be delicious on a roasted turkey, just apply it before, during, and after roasting. To begin, heat your oil to around 230. 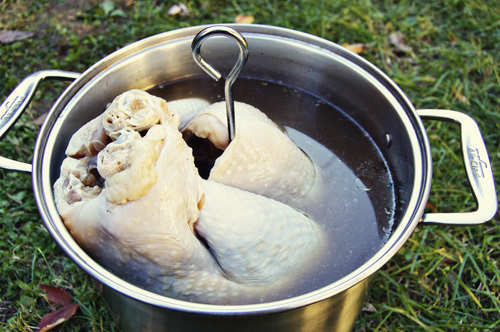 Take your turkey out of the brine, and attach it to the hook. Lower it, slowly, into the oil. If necessary, add more oil so that the turkey is covered. Raise the temperature to 375. Cook for 2-3 minutes per pound, or until golden brown. 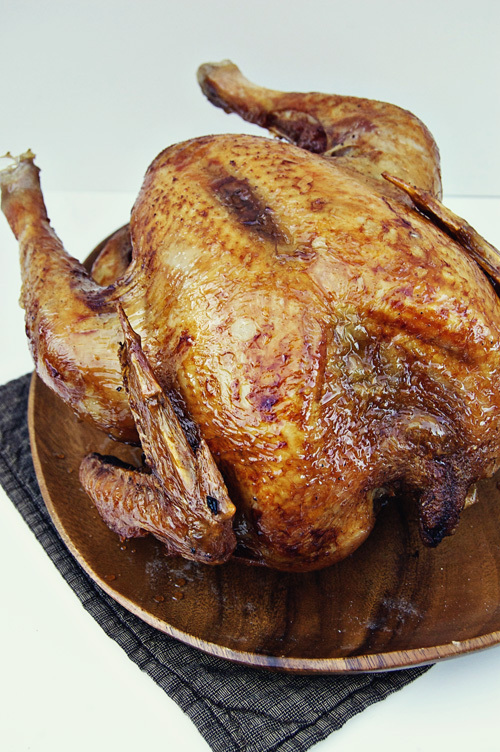 We cooked out 12 pound turkey for 31 minutes and it was perfect. 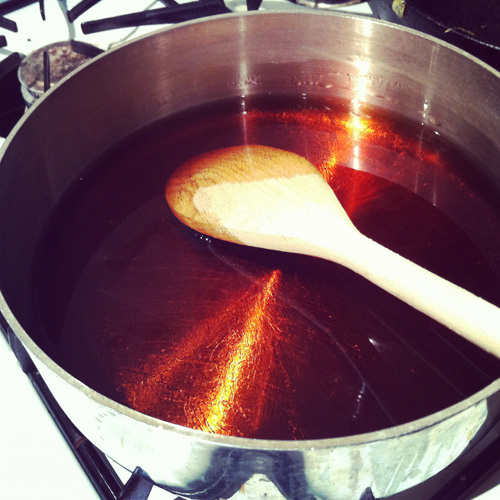 About 10 minutes before your turkey is ready to come out of the oil, combine 2 1/2 cups maple syrup and 1 cup bourbon. Simmer, stirring together. 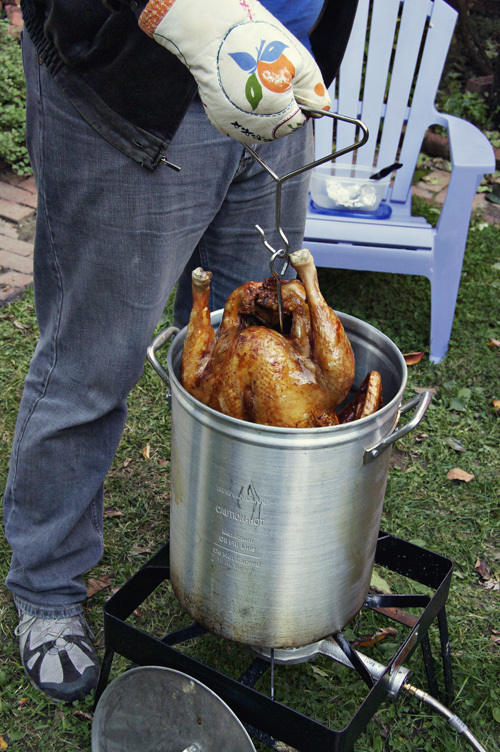 When your turkey is ready, lift it out of the oil and allow it to drain. Place it on a platter and carefully remove the hook. Immediately cover in glaze. For the next 30-40 minutes (or an hour if you’re very patient), glaze every 10 minutes as the turkey cools and its juices redistribute. At the request of the group I left the glaze on the table so people could pour more on their turkey. It was pretty delicious and totally addictive. 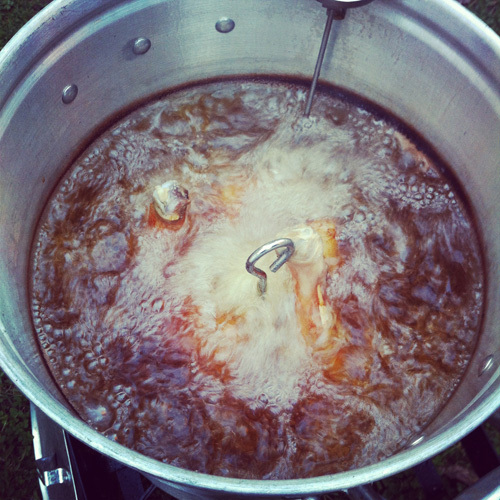 As you may know, I’m a big fan of a brined, fried turkey. That’s the way we make it at home, and that’s the way Dan and I have made it for the past two years. Not only is the end result totally moist, delicious, and perfectly seasoned, it’s a lot of fun. 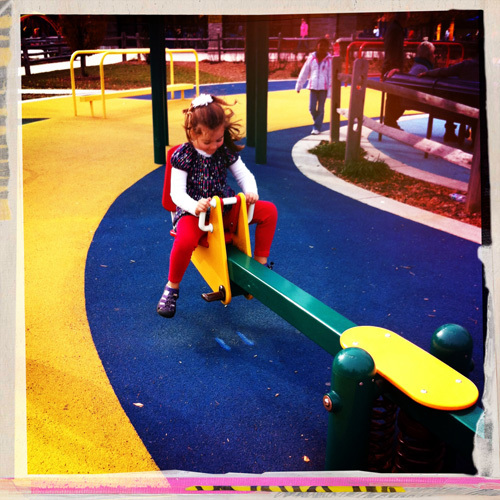 And quick. Have I mentioned how quick and easy it is? This year, in keeping with the bourbon theme, I decided to brine the turkey in a bourbon and brown sugar solution. The end result, even before the maple-bourbon glaze that everyone was dipping their faces in by the end of the night, was an out-of-this-world turkey. Perfectly salted with hints of sweetness and a spicy bourbon flavor. Fill your pot halfway full of water. Add all ingredients but the bourbon. Bring to a boil, then let cool completely. Add the bourbon, then add the turkey. 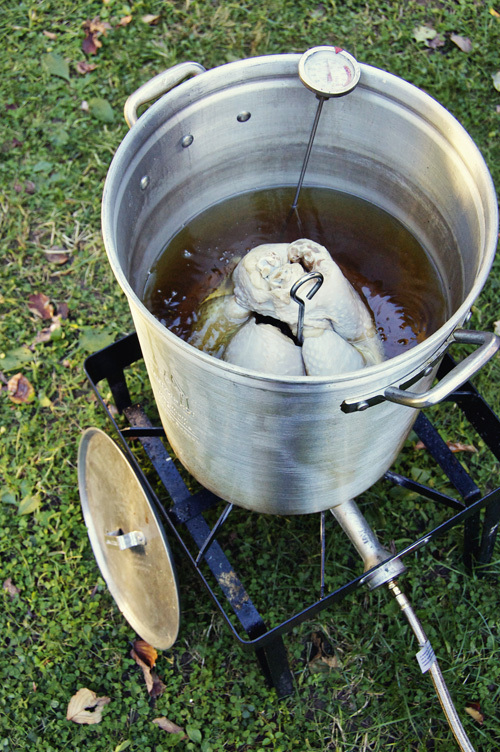 The brine should cover the turkey completely, add water as necessary. Cover and let sit for two days.